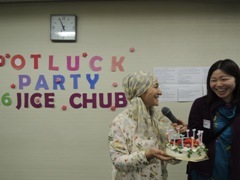 JICE hosted a potluck party for the international students living in Nagoya and Mie at Nagoya International Center (NIC) on March 18, 2016. 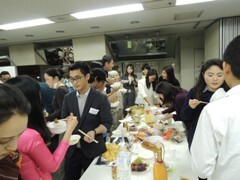 All the participants enjoyed the party while talking to each other about their study and life in Japan, and eating the food from various countries brought or cooked by themselves. 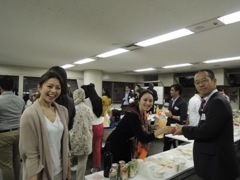 It was the third joint party organized by JICE Chubu Office. There was a variety of traditional ethnic food on the table, and on top of that, many students volunteered to be entertainers. A student from Uzbekistan and her family performed Uzbek dance. A student from Philippines played the guitar and sang Japanese and Tagalog songs. Vietnamese students sang a Vietnamese song and a student from Madagascar, an English song. It was a great opportunity for the participants to exchange their views and thoughts and to enjoy conversations with their new friends made in Japan, beyond nationality, major and grade, as the students of the same university seldom have such a chance. 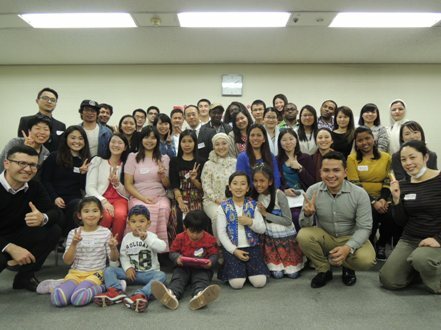 JICE will be further committed not only to support the academic activities of international students, but also to help them enrich their life in Japan through providing cultural and social opportunities for them. 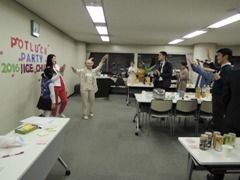 The international students from countries, their families, JICA and JICE staffs; about 40 participants enjoyed a joyful time together!